The King of Fling: This dude claims to be super-accurate with knives -- though he somehow keeps missing that chick against the board he's throwing at -- but regardless, he'll show you how to halve a newspaper with a whip, trace a girl's outline in throwing knives, and chop a cucumber from across the room. 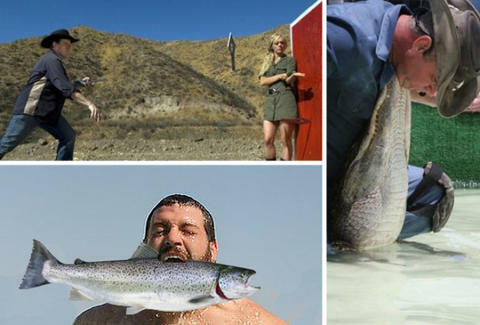 Bobbing For Trout: The last time you saw 20 grown men showcasing their inner bear, there was a lot more flannel/dancing. This time, they'll vie for a brand-new kayak by jamming their faces into an ice-cold "stream" (a big ol' bucket of water) in the hopes of nabbing a trout with their mouths within 30 secs. The Swampmaster: The 'Master will spend the weekend showing you how to catch an 8ft gator with your bare hands… and hopefully also the bloody stumps you'll have left if you actually attempt to catch an 8ft gator.